My name is Annemiek Wintraecken and I live in The Netherlands. Family and friends call me Miek and that's where "Mieks" originates. It was in the years Malcolm Forbes bought his first Eggs (1966) that in a Dutch newspaper an article appeared with photo's of some of those Eggs. I was still a child, but I fell in love instantly! Ever since that day I have collected images, stories and books about the Eggs. Just for myself, to read about the history behind these eggs, to look at the images and to wonder about the incredible beauty of these little masterpieces made for the last two Russian Tsars so long ago. In 1999 I got my first own pc and in 2004 I finally knew how to make a website and decided I was going to share my hobby with other people. 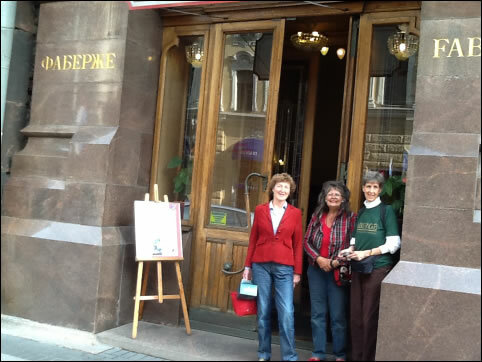 Once on the www I met other Fabergé enthusiasts and my collection grew and grew. Fabergé unites people I once heard, Fabergé Eggs did in the past and it still works in the present for through e-mail I have made some fantastic Fabergé friends! 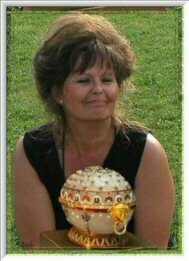 The picture above is a composition of the Renaissance Egg shown in Berlin in 2005 and me dreaming of it on my 50th birthday in Berlin. It was on that day in July that for the very first time I saw a Fabergé Egg "in reality" during the exhibition of the Link of Times Collection in Schloss Charlottenburg. I was absolutely amazed, for the Eggs were so much more beautiful than I had ever imagined! The Eggs seemed to live, the sparkling, the shining, the magnificent colors, fabulous in one word! Though I knew the heights of the Eggs, some were smaller than I had expected, others bigger, but all were of an unspeakable beauty! 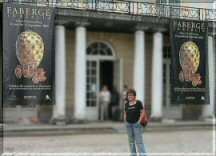 After Berlin, I went to see Fabergé Eggs in Brussels in december 2005 and there I was so lucky to see also the magnificent Mosaic Egg. I think one of the most beautiful of all. In November 2007 went to London to see the Rothschild Fabergé Egg auctioned at Christie's on November 28, and in London I met with some of the Fabergé friends I know through the internet. 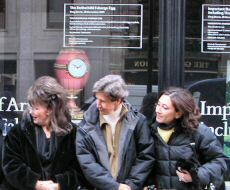 What a great time we had in London! Meeting the friends was an unforgettable event! Together we went to the Auction houses Sotheby's and Christie's and admired the many splendid Fabergé items, some we were even allowed to look at from into ours hands! On Wednesday we witnessed the Sale of the Rothschild Fabergé Clock Egg at Christie's. Unique in one word!! A special "thank you" to Kieran McCarthy of Messrs Wartski who took time during this so very busy artweek to show and tell us all about their magnificent collection, and to Carolone de Guitaut of the Royal Collection who gave us a private tour on the Fabergé Collection shown in the Royal Closet! Thank you so very much! October 2008 I learned the Blue Serpent Egg was to be exhibited for the first time ever in the US. 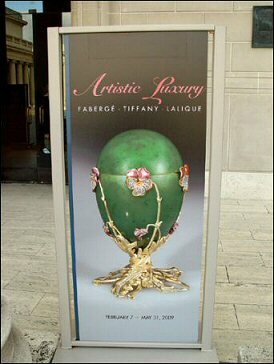 As one of my favorites, the Pansy Egg was going to be on Artistic Luxury: Faberge, Tiffany, Lalique too, as well as the Austrailan Kelch Bonbonniere Egg, the Danish Palaces Egg I missed in Brussels as it could not travel due to hurricane Katrina, to make a long story short, I went! In January 2009 I spent ten wonderful days in the United States, starting in very cold Cleveland and ending in New Orleans. 2013, September. A dream come true! March 2014. 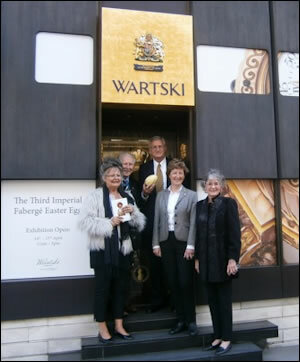 1887 The Third Imperial Egg is found an exhibited for only a few days at Wartski's in Londen. What a beauty! (The Egg). 2016. At the beginning of the year I thought it time to quit my Fabergé Egg website. Too many people "borrowed" from me and used my research without any credit. That was no fun anymore. So after almost one and a half a decade, an eternity on the internet, mieks.com that started as mrsmiek.nl, disappeared from the web. Not everything I have and know about the Eggs is online and I have a large library on Fabergé Eggs, so if you have questions, do email me! I love to talk Eggs and always answer your emails*. I do believe however that there is much more to discover about the Imperial Eggs, ánd the Kelch Eggs, so full speed ahead!